Harry Potter is one of the best selling franchise in our movie industry today, and sadly though, all things has an ending. Ten years after the film dominated the big screen and the long journey of Harry Potter (Daniel Radcliffe), Hermione Granger (Emma Watson) and Ron Weasley (Rupert Grint) has come to an end. 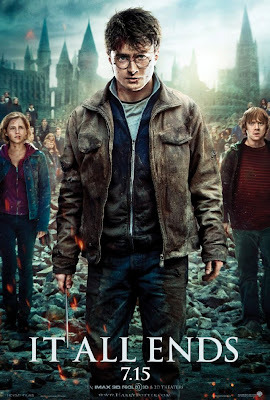 Is the final iteration epic enough for the millions of Harry potter fans worldwide? Read on.. The previous gritty and moody feel that looks like an overexposed film was still intact as the the movie started with a serious tone. If you read the book, it is natural to predict what will happen next. It is only natural to imagine what you have read and picturing it while watching the film. This technique may disappoint some fans because they will realize that the film was not depicted as it was on the book, from cover to cover. It gave a certain difference from the book as some scenes from the book where different on the movie (read some of J.K. Rowling's journal to know the story behind the changes). Again, the movie may vary from each of us. The acting of the three main roles (Radcliffe, Watson and Grint) greatly improved. The maturity of the cast gave justice to the characters they were portraying. Sadly though, some of the previous cast had little or no roles whatsoever (it was justified by the progression of the story itself). Watching this film in 3D is highly recommended as with all of the previous Harry potter films, this one gave a lot of eye candy. From the splash of the water, to the blistering hot fire. The details and blending of the CG was oh so great. Book fans will be shocked as part of the "ultimate battle" was not taken from the book. They made a "different" and "improved" version which some might like and some may not agree. In the end, any shortcomings of the film will not be necessary because the fact that this is the last of the Harry Potter films, and each and every one wanted to see how the "19 years later" was interpreted. All was well.. So who's your favorite Harry Potter character? For me it's Severus Snape. Seriously, Snape's role may not be that important to some, but to me, it was the greatest twist ever executed in a story.